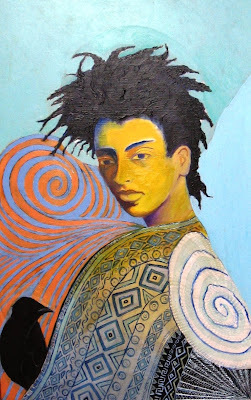 “Inside Out” by Verlena Johnson, 2006. 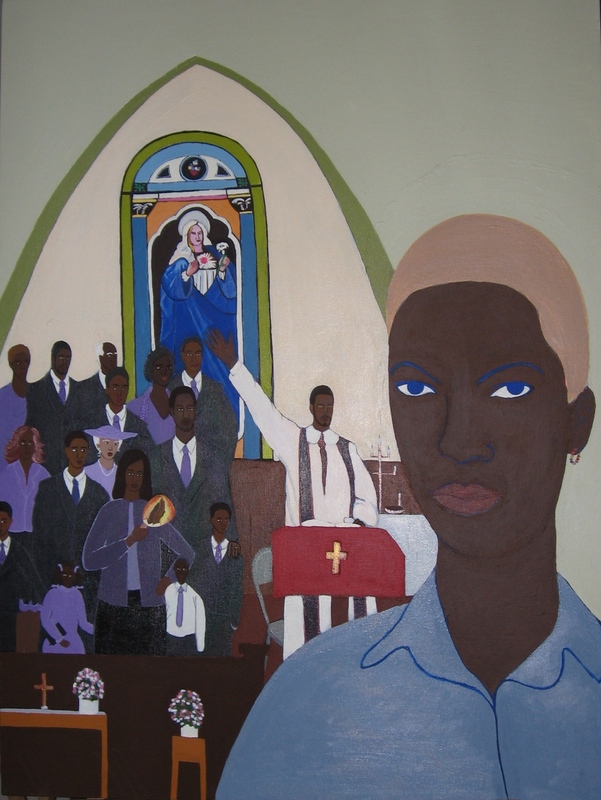 Acrylic, 40" x 30"
Lesbians in church and in touch with their own spiritual power stand out in the paintings of Los Angeles artist Verlena Johnson. Many wear halos to show their divinity. “I believe part of my purpose is to remind myself and others that we are all divine,” Johnson said. 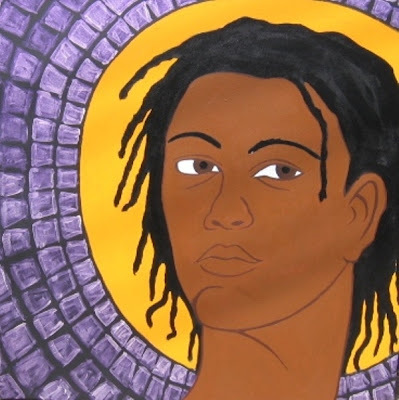 She is an African American (biracial) lesbian artist who paints spiritual portraits, primarily women with halos. They gaze into the viewer’s eyes like the saints in Byzantine icons. “One could say all of them are lesbians (although there are no visible markers of this, e.g. labrys, two women in an intimate embrace, etc. ), as many of them to varying degrees are self portraits or in some way represent me. In fact, many of my portraits are self-portraits and I am an out lesbian,” she explained. 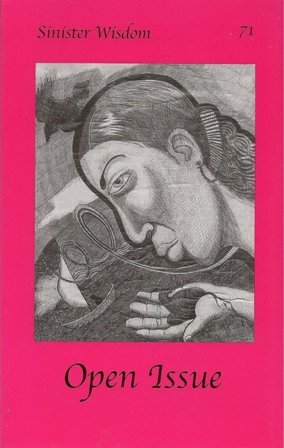 With verve and versatility, Johnson gives visual form to her unique fusion of mysticism, spirituality, feminism, queer theory and popular culture. 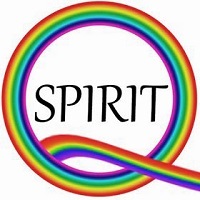 She explores the role of LGBT people in the church with “Inside Out,” pictured above. A woman gazes out at the viewer, stone-faced, with the rest of the church far behind her. A rainbow earring symbolizes her lesbian sexual orientation. The minister raises his arm while the choir and congregation are watching her. She appears to be emotionally and physically distant from the congregation. Her halo is almost invisible. The spiritual lesbian is in the church, but not of the church. A stained-glass window of Mary with white skin dominates the worship space of the black congregation pictured in “Inside Out.” Not only does this church deny LGBT people, but members aren’t fully embracing their own ethnic identity either. The lesbian has dark skin but her eyes are blue and her hair color is light, making her an outsider on race as well as sexual orientation. 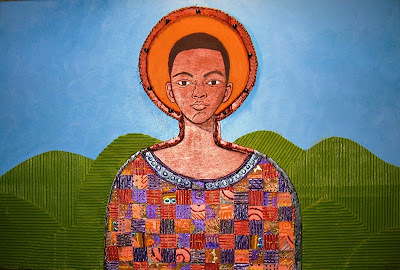 Johnson recalled that when she painted “Inside Out,” she was reflecting on the various ways that LGBT people are “out” or “closeted” in churches. Born and raised in the Midwest, Johnson earned a master’s degree in Afro-American studies (art history, 1996) from the University of Wisconsin - Madison and a master of fine arts degree from the School of the Art Institute of Chicago (sculpture, 2001). Her work has been exhibited at galleries in New York, Los Angeles, Chicago and other cities. A wide variety of publications have featured her art, including the Journal of Lesbian Studies and Sinister Wisdom, the oldest surviving lesbian literary journal. 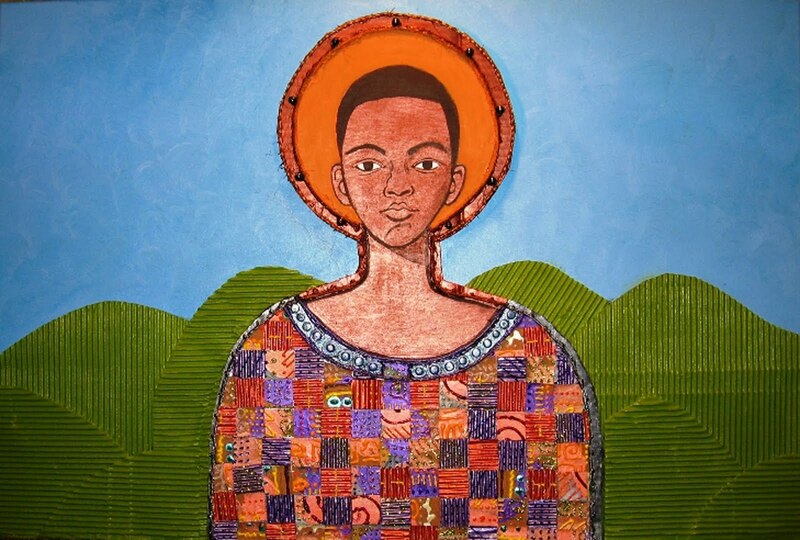 “I Am” by Verlena Johnson, 2006. Acrylic, 36" x 36"
“I believe the ‘I am’ statement is very powerful and acknowledging my own divinity in this way reinforces this knowing,” Johnson said. “Spiral Woman” by Verlena Johnson, 2001. Acrylic,32" x 20"
“Spirit Love” by Verlena Johnson, 2006. 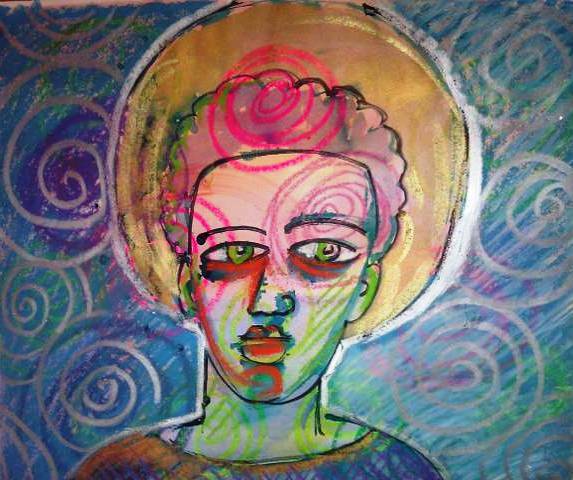 Mixed media with acrylic, 24" x 36"
The halo is particularly prominent in Johnson's symmetrical self-portrait titled “Spirit Love.” “I have taken the halo as a symbol found in early European and North and East African paintings and used them to more generally symbolize divinity and our connectedness with the Universe (or Love),” she said. Wonderful art, an intriguing post. A question: in the painting at the top, what is the torch-like object being held by the woman in the front row of the "choir"? I read through the commentary twice, and looked at the enlarged view, but don't catch the symbolism. Good question, Trudie. I was intrigued by what looks like a torch too. When I enlarge it on my computer, it seems to be a fan -- the kind that people wave in their hands to cool themselves in church on hot summer days. The background color is orange and it has a pair of dark-skinned praying hands on it. I’m not sure of the significance of this, and I didn’t ask Verlena about it. Thank you for taking time to leave a comment here. I am excited about promoting the spiritual art of emerging lesbian artists, especially those who are also racial minorities. It’s encouraging to know that readers appreciate it. Verlena worked hard to get her new website up and running in time for this article too. Thanks for the clarification, and that makes sense. Still, I wonder if there is not some major symbolic meaning? The object is so eye-catching, and I hope the artist might give us a hint. I'd be happy to discuss this. There are praying hands on the fan. As I was using several images as source material at the time I painted Inside/Out, i.e. the stained glass, I probably used an image from a fan used in a church. These fans were a part of my childhood and I have such vivid memories of them being used. In looking at the image now, I am struck by the significance of the energy emanating from the hands in prayer--as if to say that prayer is powerful. Though to be honest, I didn't think of this symbolism in that way at the time. Thanks, Verlena, for sharing what was on your mind while you were painting “Inside Out.” After the praying hands fan became a point of discussion, I started thinking that maybe it was significant that the church member is holding in their hands a fan with a picture of disconnected hands… a metaphor for the disconnect between this church and its members.